Website design is my specialty. 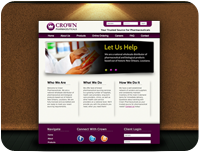 I excel in creating custom websites for clients of all sizes. My websites are guaranteed to turn visitors into customers and help add to your bottom line. A unique and accessible website is paramount in landing any business. A website will be the first impression many of your visitors get of your company so you have to make sure your site represents everything that you have worked hard to achieve. I make use of the latest technology to create all of my websites. This will guarantee that your website is going to withstand the test of time and will be able to be used for many years to come. All of my websites are created uniquely to the needs and brand looks of your business. There are no templates used here. Every site is handcrafted and designed to make sure that your company is represented in the best possible way. I offer the Content Management System, Wordpress as an add-on to all of my website designs. Wordpress gives you the ability to completely control and edit your entire site. From adding pictures, content, video and even pages it's as easy as 1,2,3!